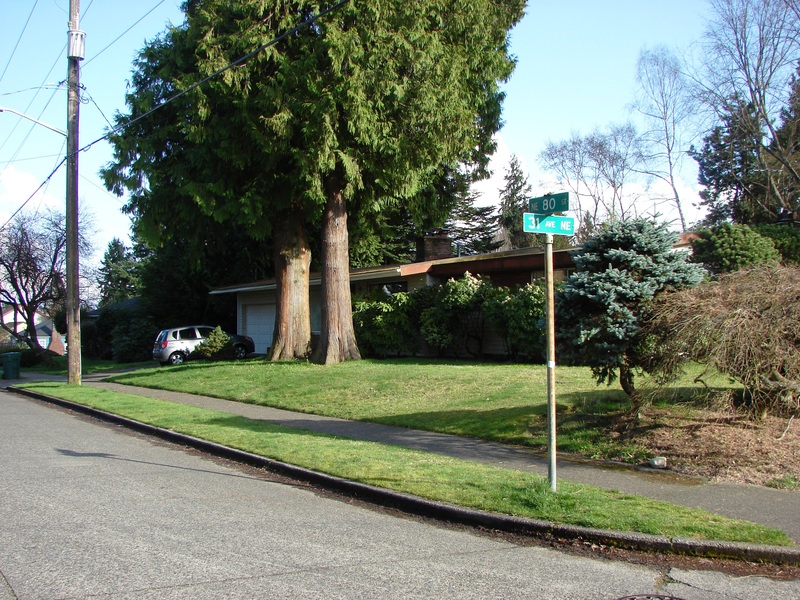 Before NE 80th Street was put through, an old house was “in the road” at the corner of 31st Ave NE. This photo shows what the corner looks like as of the year 2013, looking eastward on NE 80th Street. In 2018 this house was torn down and a new house was built. The years 1945 to 1955, from the end of World War Two until the Wedgwood neighborhood came completely into the city limits of Seattle, were years of rapid change. The population of Seattle had swelled with war workers in the 1940s and after the end of the war in 1945 there was even more of a post-war increase in housing demand. In hte 1950s in Wedgwood there was a frenzy of house-building with its associated completion of streets, but in some places in Wedgwood the once-rural roads could not easily be put through. For two years, from 1954 to 1956, a Wedgwood homeowner fought back when the City of Seattle informed him that his house was “in the road” and would have to be moved out of the way. Alfred W. Boulden was born in England and came to the USA with his parents in 1870 when he was two years old. The family lived in Ohio and then in Michigan where Alfred married in 1894. After Alfred and Mayme had their first son, as his parents had done before him, Alfred and his family migrated farther West. The Bouldens came to Seattle in 1903 and spent the rest of their lives here. For four years the Bouldens lived in Georgetown where a second son was born to them. In 1907 the family was able to move to their own house in a remote area where the lots and the living were cheaper, the future Wedgwood neighborhood. 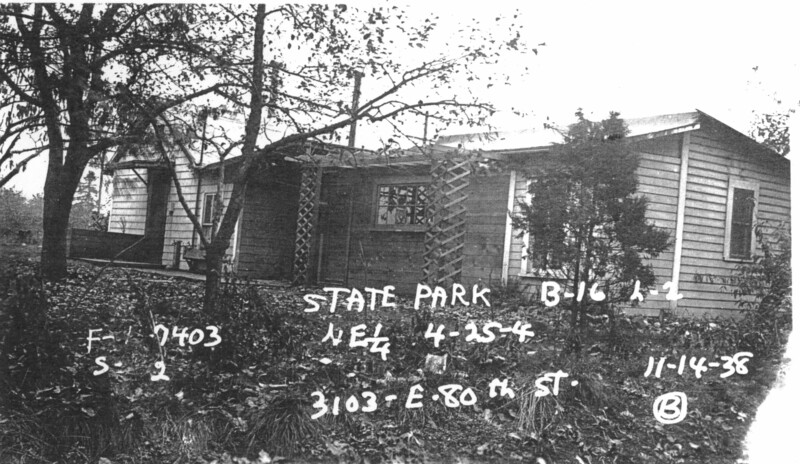 At that time the area had no name but the Bouldens’ new house was in the plat of the State Park Addition which had been filed by Charles H. Baker. The city directory listing for the Bouldens’ house was “southeast corner of NE 80th Street and Charles Avenue” (later numbered 31st Ave NE.) After house numbers came into use, the address was 3103 NE 80th Street. The legal description of the property is Block 16, Lot 2 in the State Park Addition, in the NE quarter of Section 4, Township 25, Range 4 East. The House in the Road was built in 1907 on NE 80th Street at the corner of 31st Ave NE. Photo courtesy of the Puget Sound Regional Archives. It is also possible that the Bouldens were early car owners, which would have eased the difficulty of living in remote Wedgwood. Mr. Boulden’s work was in the delivery business, listed on the census of 1910 as an “expressman” and on the census of 1920 he was listed as a truck driver. By 1930 both Mr. Boulden and his younger son George were associated with an oil company and a chain of gas stations. In 1930 George was 25 years old and he operated the Boyer Service Station at 24th & Boyer in Montlake. In early Wedgwood there was no electricity or city water supply. When house lots were sold, the boundaries of the lot were to be marked. Homeowners would decide how to place their new house on the lot according to where the water source (a well) would be, and where streets would be at some future time when streets were put through. In the case of the Bouldens’ house in 1907 a mistake was made, because the Bouldens’ house was later found to be placed partly out over the property line into what became NE 80th Street. The neighborhood was still in unincorporated King County and had a very rural aspect, so no one did anything about the house until the growing years of the 1950s when NE 80th Street was to be officially put through on that block. By the 1950s the Bouldens were gone and the next owner of the aging, dilapidated house at 3103 was using it as a rental. It was starting to be considered an eyesore by some, as the house was in contrast to Albert Balch’s brand-new Wedgwood development directly across on the north side of NE 80th Street. The City has advised counsel for Floyd Van Sant that they will not do anything about his house located at 3103 NE 80th Street. In a test case, appealed to the Supreme Court by the City, it was decided that Van Sant owned the property upon which his house was built. His house was inadvertently constructed in a platted street area some fifty years ago. Prior to the decision of the Supreme Court, the City had filed an action to condemn a portion of Van Sant’s property, which action would require removal of the house from the street area, enabling completion of a sidewalk. The street has been laid to within one foot of Van Sant’s house, creating a very dangerous condition, as pedestrians must walk in the street to get around it. Unless the City proceeds with the condemnation action, the present hazardous condition may continue forever. City letter of March 26, 1956, compensation award of $2,575.00 to Mr. Van Sant for the house in the road. Comptroller file 228959, Seattle Municipal Archives. Within the next year, the City of Seattle arranged a compensation payment of $2,575.00 to Mr. Van Sant for taking the land that the house sat on, but Mr. Van Sant still needed to move the 3103 house, since the building belonged to him. The house was too dilapidated to be moved, however, and King County property records show that the house was torn down. A new house, also numbered 3103 NE 80th Street, was built in 1956, and this house was constructed properly on the lot and not in the road. I don’t know whether Mr. Van Sant was involved in building the new house; he may have sold the lot to a developer. Although he was not a Wedgwood resident, as owner of the 3103 house Mr. Van Sant became a folk hero to some Wedgwoodians in the 1950s who didn’t like the enormous changes in the neighborhood, from rural to urban life. Many people felt buffeted and bruised by the rapid post-war changes in society and the bumpy process of becoming part of the City of Seattle. Some people saw the 3103 house as a symbol of once-rural Wedgwood and they enjoyed hearing how Mr. Van Sant stood up to the City in a triumph of the little guy over bureaucracy and “progress.” Other people felt that Mr. Van Sant was impeding progress and they wanted him to hurry up and get his eyesore house out of the road. The story of the House in the Road is an example of the sometimes-painful growth of Wedgwood in the busy years of the 1950s. Prior to demolition, the fire department did practice-rescues at 3103 NE 80th Street. In the year 2018 the house at 3103 NE 80th Street has again become a symbol of development pressures and growth in Wedgwood. The house at 3103 NE 80th Street has been torn down and a new house is being built. October 2018: a much-bigger new house is being built at 3103 NE 80th Street. Census, city directory listings and newspaper obituary info for Alfred W. Boulden. “King County Land Use Survey“, HistoryLink Essay #3692, Paula Becker, 2002. Puget Sound Regional Archives, Bellevue, WA. Original property record card for the house at 3013 NE 80th Street with a photo dated November 14, 1938, written on the right side of the photo. Other writing on the photo gives the legal description of the State Park plat, Block 16 Lot 2. In 1936-1940 King County undertook to photograph every existing structure for the assessment of property taxes. From that time forward, houses were photographed soon after they were built, so a 1952 house, for example, would have a photo on file from that year. For houses built before 1938 the original property records of King County only have the 1938 photo. Sometimes an earlier photo can be found in newspaper or neighborhood history records. Seattle Street Directional Designations: Seattle changed the directional scheme for street names in 1961, and the map on the Seattle Municipal Archives shows the designations before and after 1961. On the 1938 property card photo shown in this blog article, the house address was written as East 80th Street. Now it is Northeast 80th Street. Seattle Municipal Archives, Comptroller File #228959, “Report Corporation Counsel on award in condemnation for NE 80th Street,” April 9, 1956. File numbers are on-line; the info is on microfiche which can be read in the research room, third floor of City Hall. 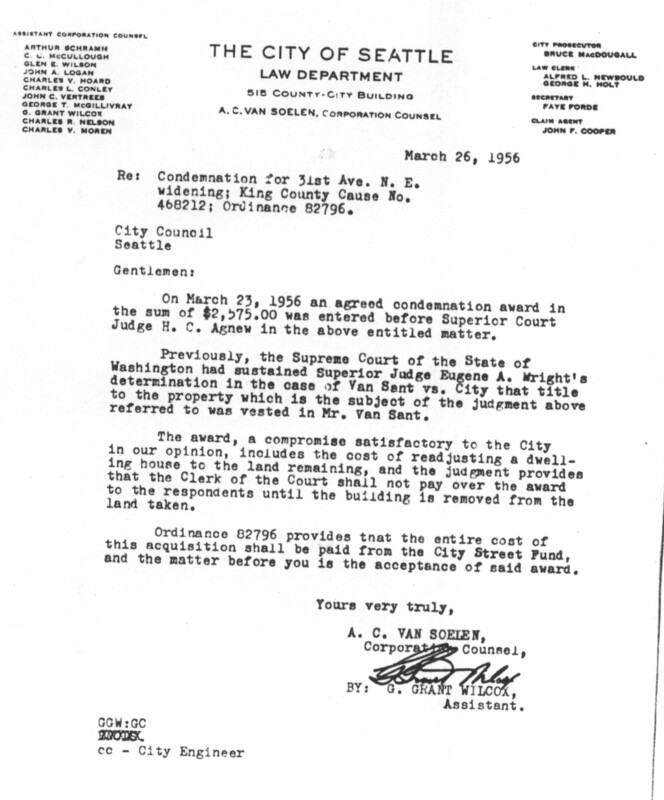 I printed out the 1956 letter from the City of Seattle Law Department, shown here. This entry was posted in Controversies, Houses, Plat names, streets and tagged Neighborhood History, original house photos, Seattle, Seattle city limits, Seattle street names, Street directional designations, the 1950s in Wedgwood. Bookmark the permalink. I didn’t know that Wedgwood’s streets had other names before their current “number names.” How interesting! Do you have any more information on the old names? Diana, this is a great question. King County property records are on-line and you can look up your address – see the “Parcel Viewer” link at the end of this article. On the right-hand side of the property-info page is the tab for “scanned images of plats.” The original plat map has the old street names if the plat is old. Other examples mentioned on this blog are the Pontiac and Manhattan Heights plats for which names of Indian tribes or places in New York were used. Mary Chandler used some names from her native Maine on her plat which is now the site of the P-Patch. Newer plats, such as Balch’s 1940’s developments, were filed under the current street numbering system. Plat names are one of my interests and is one of the categories on this blog. Use the “Plat Names” tab in Categories to see more articles about the origins of some Wedgwood plat names — who named them, when and why.